BKFA Birthing Kits are a simple and effective tool for basic infection prevention and first-line childbirth care. The components are selected in line with global best practice and consist only of the essential items required to support the documented 6 principles of cleanliness at birth for mothers in high-risk and emergency settings. The Birthing Kit is reviewed annually as part of BKFA’s commitment to better understand the social and environmental impact of the Birthing Kit. 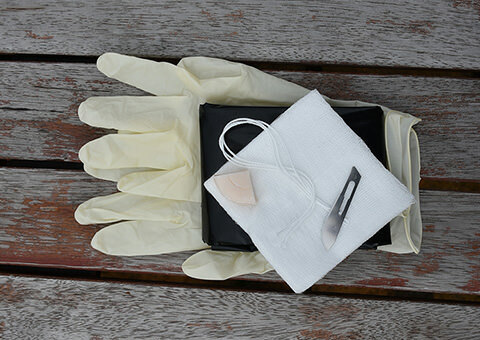 Disposable Delivery Kits are recommended by the World Health Organisation (WHO) as an essential tool for use by birth attendants when a delivery occurs at home, and particularly in emergency settings. In many low-resource settings health facilities are not adequately equipped with clean supplies so kits can also be used to resource and improve the basic cleanliness of these environments. Generous supporters raise funds and organise events to assemble Birthing Kits. Thousands of volunteers contribute to our Birthing Kit supply each year. Read more about becoming involved and holding your own ‘Assembly Day’ here. We send Birthing Kits as part of a grants program to organisations that have undergone an application and approval process to become a Field Partner. This capacity and risk assessment process ensures our Field Partners are able to identify vulnerable populations and can effectively integrate the Birthing Kits into their existing programs and/or services. Read more about becoming a Field Partner. We also send Birthing Kits to approved organisations that deliver frontline assistance and services to the most vulnerable populations in emergency settings.